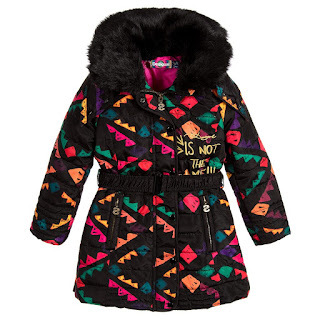 Now the weather has changed our kids need wrapping up I always find it hard to find good jackets for Leanora, but I've hunted the stores and scoured the world wide web and I've finally found Leanora's Autumn jackets. I am a bit picky and very fussy on what I buy, I look at the colour, they style, the longevity of the outterwear and certainly the cost. I probably should only buy 2 jackets, 1 for rainy/cold weather and a second for a more formal dressing up coat, but with some many great brands offering so many different styles I just can't resist the temptation. Mumma and pappa and non parents grab a cuppa and kick back and see what I have found for your little darlings, a little tip, buy a size up as it will last a longer and a great saving on the pocket. HM are totally slaying it this season, for both kids wear and women's wear. Now every girl needs a great biker jacket and HM are offering that right now for girls. I bagged this beaut of a biker jacket with an amazing detachable fur collar for only £29.99 Similar. 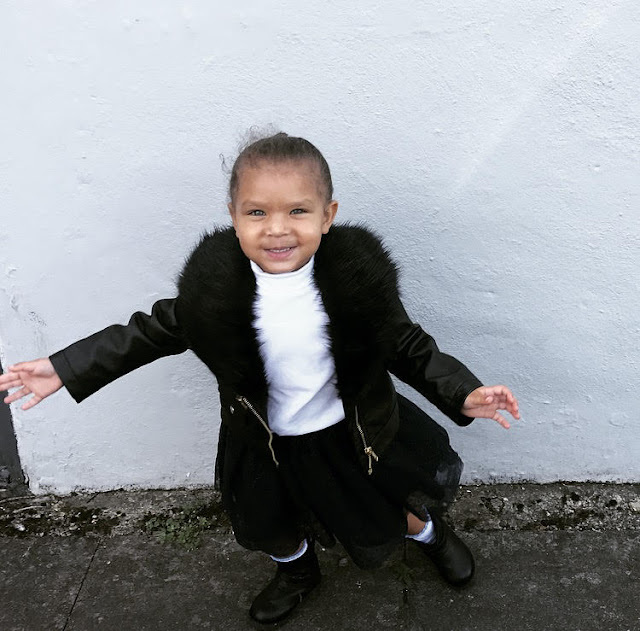 Biker jackets are great for edging up any girly outfit, plus looks great with skinny jeans and a striped top, you may remember my love of all things striped in my Essentials Every Kid Needs post. 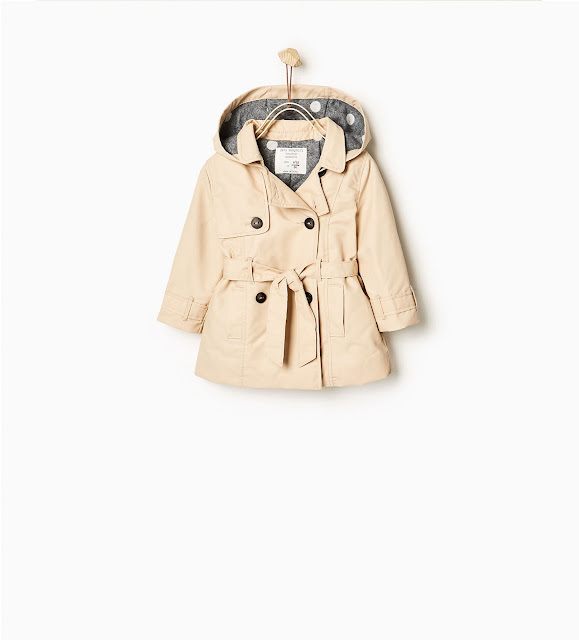 You can never go wrong with Zara and what I love is that every year they update their kids trench coat. Whats new this year is that there hooded trench coat is padded which is great to protect our little ones from windy miserable rainy days, plus its got a great polka dot print on the inside of the lining and has a great shape to. Now the jacket of the season is the puffer jacket. I am currently lusting over this Desigual puffer from Children's Salon for Leanora. I love the print and colours, it kind of gives off an 80's vibe to it, and I'm an 80's baby, so anything in the era is cool with me. Looking for a dressing up coat, every kids needs one for those special occasions, then look no further to Cos. I have recently been buying a few bits from Cos, the have great basics and to boot great kids wear. 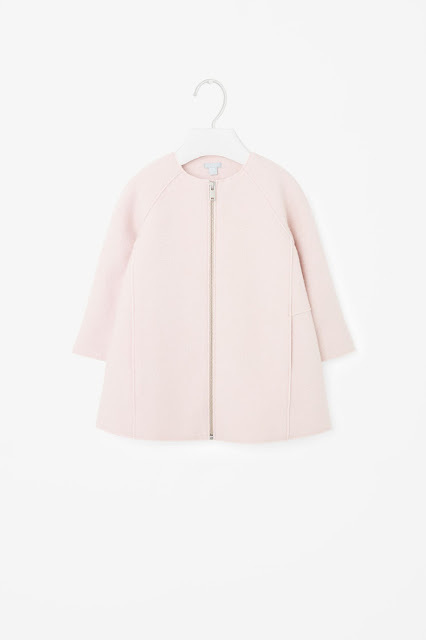 I did not even know they did kids wear, I bagged a gorgeous pink scalloped top recently from there for the little Cha Chi and spotted this gorgeous raw edge wool coat. I hope you liked are Autumn jacket selection, have you seen any other great jackets out there? Don't forget you can also keep up to date with us on Bloglovin and Facebook, so please come one over and say we love to speak and meet our readers. Plus to see all the shenanigans we get up to follow us on Instagram.